Our Tree Frog Friends are Back! 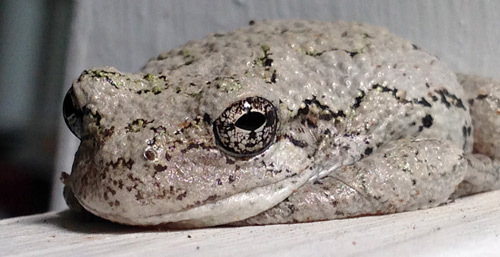 Recently we’ve been seeing a lot of our friendly gray treefrogs on the deck and around the front porch! We’re happy to have them hang around to eat beetles, ants, and other insect pests that may plague our gardens! Here is a post I wrote in May of 2014 when we first noticed these little insect predators! Well, spring is finally here to stay – I hope! In fact, lately it seems that we have skipped spring and gone right into summer! It’s been downright hot out there the last few days! It sure has been a roller coaster ride of high and low temps this season! Spring was very late this year and, with the exception of the redbuds, the flower show of blooming trees seemed to be less than spectacular. Eric is currently teaching his Field Botany May Term course for Mary Baldwin College and he comes in most days disappointed with the slow progression of spring and the lack of blooming wildflowers. They finally saw some Pink Lady’s Slippers on Friday. Just two weeks ago, tiny oak leaves began to pop out and now they have expanded to nearly full size. The pollen-filled catkins are hanging down from the branches and every outdoor surface is beginning to be covered with oak pollen. The pine pollen won’t be far behind – I have just noticed that the male cones are beginning to develop on our big pines. Pollen season is upon us! For several weeks, we have been hearing the trill of the treefrogs in the evening. This is always a sign that spring is near. 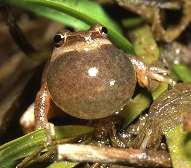 The spring peepers are one of the first treefrog species to emerge and begin singing. You can often hear them in early March. They were late this year and I just heard from my family in Vermont that they are now singing in earnest up there. The sound of their trilling can be deafening on a still night! “Spring is here,” they seem to say! 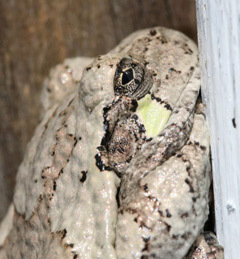 Male gray treefrog with throat pouch expanded. Very pale against the pole. One warm morning last week as Eric and I were having coffee on the deck, Eric noticed a pale gray blob wedged beside the pole that holds our wind speed indicator. When I went closer to investigate, I discovered it was a treefrog which Eric later identified as a gray treefrog (Hyla versicolor). He was a cute little guy and was doing his best to blend in with the pole. Eric was able to get some good pics. 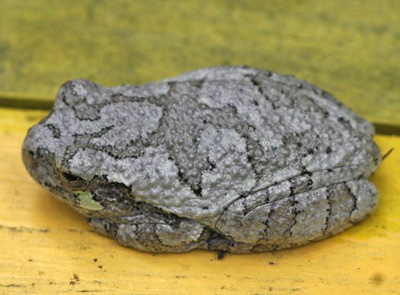 Gray treefrogs are common throughout the eastern US. They are large treefrogs with grayish skin that is surprisingly dry and warty for a frog. They aren’t quite as warty as a toad but more so than the typical frog. Gray treefrogs are able to change their skin color to some degree in order to blend in with their background; sort of like a chameleon only the change isn’t quite as dramatic. He was very pale when he was up against the white pole but when he moved away from that light background, he slowly became a bit darker. It was very interesting. when he moved away from the white pole. One of the distinguishing traits of treefrogs is the large discs at the tips of their toes. These toepads allow them to climb up vertical surfaces like our deck post. 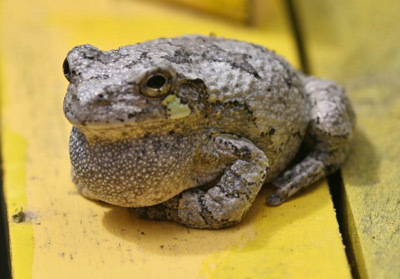 Apparently, gray treefrogs have particularly large toepads but we couldn’t see his toes very well – he kept them curled up under his body most of the time. Treefrogs typically vocalize/sing at night but this guy started singing a little bit while he was on the deck – perhaps he was just confused! It was interesting to see his throat pouch balloon out each time he called. The males are the only ones that sing. They sing to attract the female frogs. 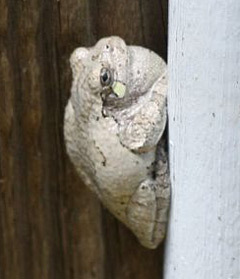 Gray treefrog calling. They usually sing at night to attract females. Frogs and toads are wonderful “friends” to have in the garden because they prey on many of the pests that are destructive to both our ornamental and vegetable plants. They eat insect pests like beetles (including cucumber beetles), crickets and grasshoppers, ants, earwigs, and cutworms. light patch below their eye. Like I said – great friends to have in your garden! Toads are especially nice to have around because they LOVE slugs and even snails. Many gardeners put “toad houses” in their gardens just to encourage these warty friends to live amongst their plants. And contrary to popular belief – you can’t get warts from handling toads! We were happy to find this little visitor on our deck. I hope he sticks around to feast on some of the bugs that get in our deck lettuce every year. I bet those nasty green aphids would be easy (and tasty) pickings for a treefrog! Fat, Furry, and in a Hurry! I couldn’t help re-posting this! The fuzzy little travelers are all over the road these days! I’m sad that most of the ones I have seen are more brown than black. I hope they are wrong! I’d love to see some big snowstorms this winter! Read on and enjoy! Why does the woolly bear cross the road? The woolly bears seem to be on a mission! So many are crossing the road these days – and they’re not dilly-dallying either! They’re moving along at a pretty good clip – for a caterpillar that is! I find it very curious. Driving to work in the morning, I’ll see four or five at a time crawling across the highway. Then I’ll go a little further and find several more booking it across the road. I try to avoid them but there is only so much you can do. They seem to be everywhere. 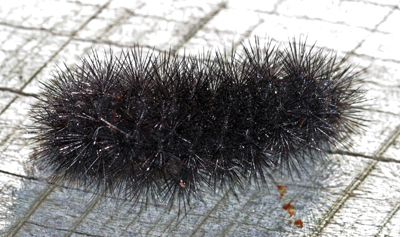 A solid black leopard moth caterpillar. I did see several in one of my gardens this weekend when I was doing some weeding and mulching. I picked one up and he immediately curled up in a tight little ball so characteristic of these caterpillars. I even found a large solid black “woolly bear”. 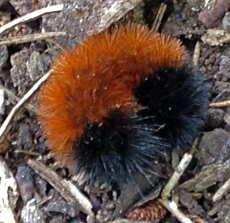 This guy was a different species from the banded woolly bears that I was used to seeing. It turns out that he was the larval form of the giant leopard moth (Hypercompe scribionia), a really pretty white tiger moth with a beautiful pattern of black circles and rings covering its wings. You can definitely tell where its name comes from! The caterpillar is solid black with narrow bands of red between the segments. are difficult to see when it isn’t curled up in its defensive posture. 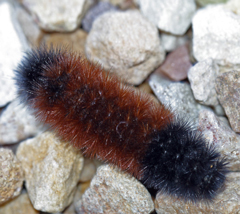 Banded woolly bears are the larval form of the Isabella tiger moth (Pyrrharctia Isabella). The adult moth of this species isn’t nearly as colorful as the beautiful giant leopard moth but its caterpillars are pretty adorable! There are usually at least two generations of these moths during the season. The last generation normally hatches out around August and these will overwinter in the larval caterpillar stage – the familiar, loveable woolly bears. Fortunately, these guys are not considered to be major pests in the garden. I guess we notice them in these places because that’s where WE are and they just happen to be on the move! Most of these caterpillars will spend the winter curled up under leaf litter on the forest floor, under stones or rotting logs, or nestled down in piles of wood. During the winter, woolly bears are able to survive freezing temperatures by producing a type of “antifreeze” or cryoprotectant in their circulatory system that protects their cells and vital organs from the damage which would occur if ice crystals formed. So they survive in a frozen state all winter long – at least in the colder parts of their range. These guys are found as far north as the arctic! In the spring, the frosty caterpillars thaw out and wander around eating a little before settling down to spin a cocoon. The adult moths emerge about a month later, mate, lay eggs, and a new generation begins. 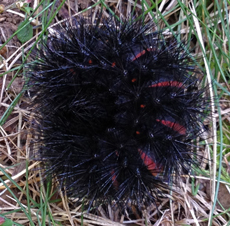 So now you know why the woolly bear crosses the road – maybe! We sure didn’t have much luck with our vegetable garden this year. The tomatoes produced half-heartedly, the summer squash succumbed to disease and vine borers before providing very many squash, and the corn was torn down and destroyed by some critter before the ears had completely filled out! 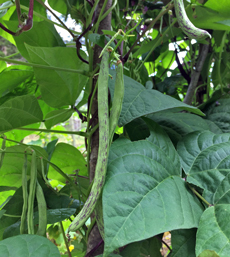 Rattlesnake pole beans – my favorite! We did get quite a few cucumbers before disease claimed the vines and I was able to can 42 pints of pickles. The rattlesnake and purple pole beans have also done very well. We were, however, disappointed in the ‘Lazy Housewife’ pole beans that we tried this year. They were very slow to develop and when they did, the beans were tough and leathery. We are just letting them dry on the vines and will use them for dried beans. Last weekend we harvested all our butternut squash. There weren’t as many as last year but I hope they are as good. The other winter squash we grew was Buttercup. This variety was new to us but it is absolutely delicious! The flesh is a beautiful bright orange and couldn’t be sweeter! This one is definitely a keeper – we will be planting it again next year. 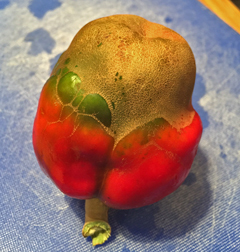 Our bell peppers provided some of the strangest looking fruits in the garden. From the top (at the stem end), they looked fairly normal but at the blossom end, the skin was light brown, rough, and hard. 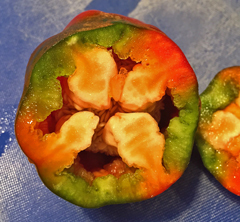 In many cases, the whole bottom half of the pepper was like this. I knew it wasn’t blossom end rot because the flesh wasn’t really damaged – it was quite superficial. I had never seen anything like it before. I thought perhaps it was environmental or maybe a mosaic virus but nothing really fit. Then I wondered if it had something to do with the herbicide drift that injured our tomato plants back in the early summer but the descriptions of herbicide damage to peppers didn’t really match what was going on with our peppers. Finally, after reviewing photos of pests and diseases of sweet peppers, I found the answer – cyclamen mites! I never would have thought that this was an insect problem. Well, actually, mites aren’t insects but you know what I mean. 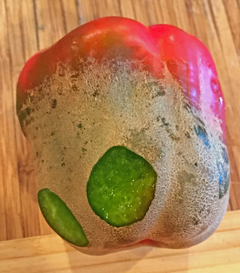 bottom half of this pepper. Cyclamen mites (Phytonemus pallidus) are tiny mites that attack many different plants including peppers and tomatoes. As these little pests feed, they inject chemicals into the plant tissue. These chemicals act as growth regulators and cause abnormalities in the foliage and fruit. 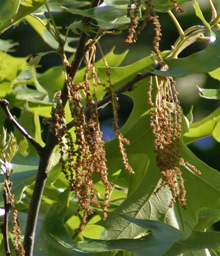 Feeding in the foliage causes crinkling and twisting of the leaves and sometimes leads to the formation of larger than normal leaves. I wish I had taken a picture of the foliage because that was another thing I noticed about these pepper plants; their leaves were huge and puckered. The damage is only skin deep! When cyclamen mites feed on the developing fruit, their salivary secretions cause the skin of the fruit to become tough and russeted. This tan, rough skin was very obvious and fairly extensive on many of our peppers. It mostly occurred at the blossom end and seemed to restrict the normal growth/expansion of the fruit – almost like the pepper was constricted by tight netting. 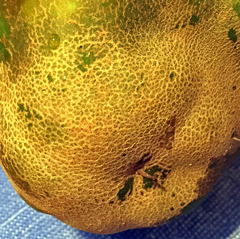 Though the russeting is superficial, it essentially ruins the part of the fruit that it covers. I did peel some of the tough skin off one of my peppers and tasted it to see if the flavor was affected. I thought it tasted a bit weird but that could have been all in my head. Still, I ended up tossing the majority of the defective portions in the compost. the russeting over the skin. University of Maryland Extension says that cyclamen mites can be a “minor pest of pepper and tomato”. When we lost so many peppers this year, it didn’t seem like a minor problem to me! I’m sure what they meant is that they aren’t common pests of peppers in the vegetable garden. Apparently, these pests are more common in greenhouse situations. We did purchase a few of our pepper plants from a greenhouse so perhaps we introduced them to the garden that way. If you notice the damage early on (and recognize it as mite damage), you can control cyclamen mites with a miticide such as Bonide Mite-X and still have a good harvest later in the season. Even though these mites did a lot of damage to our pepper crop, I must say it was pretty interesting to learn about them. 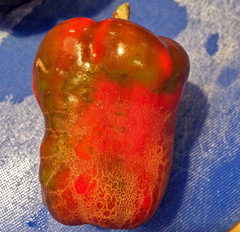 It’s amazing to me that such a tiny critter could cause such dramatic abnormalities in the peppers and their foliage! I’m just trying to look on the positive side! Who shot Silly String at that plant? On a walk in the Smoky Mountains last summer, we came across a patch of plants that were covered with what looked like yellow Silly String. It was crazy looking! Strands and strands of fine golden strings were draped over and twining around these poor plants. 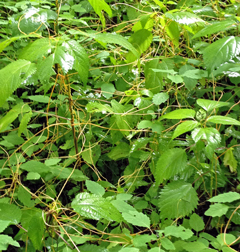 Eric knew what it was right away – dodder; a parasitic vining plant also known as scaldweed, strangleweed, devil’s hair, devil’s guts, love vine, and many other equally descriptive common names. Dodder (Cuscuta spp.) is an annual plant that is effectively leafless and has contact with the soil only as a young seedling. These plants do not manufacture chlorophyll so they are unable to produce their own food through photosynthesis like green plants can. With the exception of the first few days after germination, dodder is entirely dependent on a host plant for the water and nutrients needed to complete its life cycle – an obligate parasite! Despite its lack of chlorophyll, dodder IS a flowering plant and produces many clusters of tiny flowers from June through the fall. If pollinated, the flowers will form seeds just like other like flowering plants. In fact over the course of a season, a single dodder plant is capable of producing thousands of seeds! Dodder seeds typically germinate in the spring and the seedlings, which have thin, vine-like stems, grow upwards and twine around the first solid object they encounter. Since the dodder seeds generally drop to the ground under the mother plant, the seedlings normally germinate among suitable host plants. For the first few days of growth, the dodder seedlings survive on nutrients stored in the seed. If they do not contact a host plant within 5-10 days, they will run out of food and die. 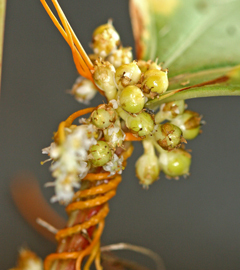 Once dodder contacts a host plant, it quickly twines around the stem of the plant and small structures called haustoria are produced along the dodder stem. The haustoria penetrate the vascular system of the host and begin to extract carbohydrates and water from its stem. At this point, the dodder plant is completely supported nutritionally by the host. The original (seedling) stem of the dodder eventually withers and this parasitic plant loses contact with the soil. 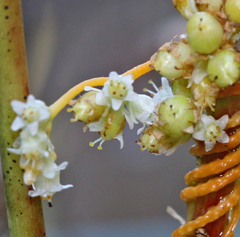 Once attached to a host plant, dodder continues to grow and reattach in multiple places along the host stem. Individual plants will often spread to nearby host plants creating a mass of stringy orange stems which can cover large areas. This is what we came across on our hike in the Smokies. form a tangle of stringy stems. Parasitic organisms rarely kill their hosts since they rely on them for sustenance. Dodder is no exception and, though they may weaken and stunt the growth of the host plants, they generally do not kill established plants. However, if they attach to seedling plants, they can seriously weaken them and may end up killing these young plants. If it becomes established in agricultural fields, dodder can cause a significant reduction in crop yield. Alfalfa and sugarbeets are common host plants for some species of this parasitic plant. 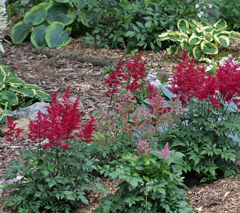 It can also infest ornamental plants including many perennials and annuals. 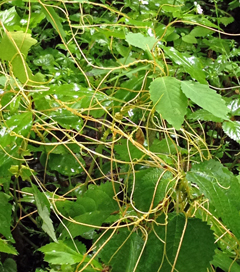 Japanese dodder (Cuscuta japonica) often parasitizes trees and shrubs, including many types of fruit trees. contain up to 4 seeds each. This is one unusual plant! 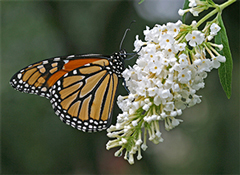 It can become a serious garden pest and unfortunately it is usually difficult to control. 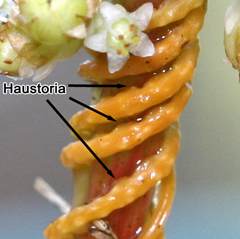 If you pull the stems off the host plant, any haustoria that remain embedded in the host stem will resprout and continue to parasitize the plant. If it is allowed to set seed, thousands of seeds can drop to the ground! A pre-emergence herbicide can prevent the germination of dodder seeds but these seeds have a hard seed coat and have been found to remain viable in the ground for more that 20 years! Yikes! One recommendation for control of dodder in the garden is to completely remove all the host plants and replace them with a non-host species. Thus any dodder seedlings that germinate will not find a suitable host and will die off. If you find this crazy parasite in your gardens, I hope you are able to win the battle against it! My Tomatoes Have Struck Out! larger than 2″ in diameter! My tomatoes are a disaster this year! Their growth is slow and they are not producing many flowers or fruit. Plus, the fruit that has formed is way smaller than it should be. It’s very disappointing! I planted about 40 plants which included 9 different varieties, most of which are heirlooms because they are so delicious. Normally by this time of the season, the plants would be lush and full and looming over the top of our 6 foot trellises. There would also be lots of beautiful full-sized tomatoes with many more coming on. Not so this year! The season started out on a downside when, within a few days of planting out my transplants, we noticed some severe cupping and curling of the foliage especially on the youngest leaves. When I saw it I immediately thought – classic 2,4-D herbicide injury! I wish I had taken some pictures of the damage. It affected all of the tomato plants. I also noticed 2,4-D injury on our grape vines which are growing on the hill above the vegetable garden. Tomatoes and grapes are especially sensitive to broadleaf herbicides. Even light exposures can result in injury to the plants. If an herbicide like glyphosate (Roundup) or one that contains 2,4-D or dicamba is applied in the vicinity of a vegetable garden, it can easily drift onto the plants. Herbicides can drift pretty far if caught by the wind! We hadn’t sprayed anything but we found out later that a neighbor had been spraying a product containing 2,4-D to control thistle in the field right beside our vegetable garden. The spray must have drifted onto our newly planted tomatoes. We planted our tomatoes and most of the rest of the garden on the 21st of May. June had higher than normal rainfall, often in the form of heavy thunderstorms. 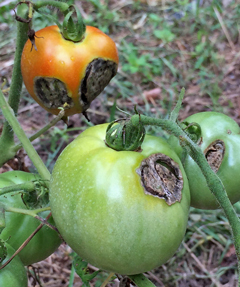 This wet weather led to disease problems, especially in our heirloom varieties which make up about 80 percent of what we grow. 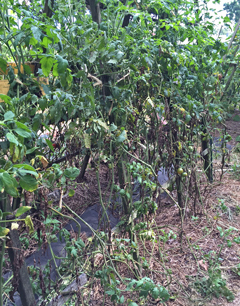 We always have some disease in our tomatoes that wipes out their lower branches but it never seems to affect their production much. This year it was much worse. I am pretty convinced that the herbicide injury weakened and stressed the plants and left them more susceptible to fungal diseases. Though we never seem to have much insect damage on our tomatoes, we have had an occasional hornworm on the plants. So far this year, Eric has discovered two hornworms on the tomatoes but only after they had almost completely defoliated a couple of the plants and chewed a few of the tomatoes as well! They are well camouflaged and it took a bit of hunting before he found and squashed the two culprits. Hopefully there aren’t more lurking among the foliage. With all these strikes against them, the plants have suffered tremendously. The foliage is sparse and the stems are elongated and spindly. I think this is mainly due to the herbicide injury early in the season. are small and some are deformed. 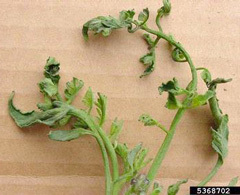 Though the plants have slowly outgrown the damage and the new growth is fairly normal, the plants are stunted and few flowers are being formed. The fruit that has formed is mostly remaining very small. I harvested a few medium-sized ‘Cherokee Purple’ tomatoes but most were deformed with severe cat facing (another symptom of 2,4-D injury). Some of the problem may be environmental, too. 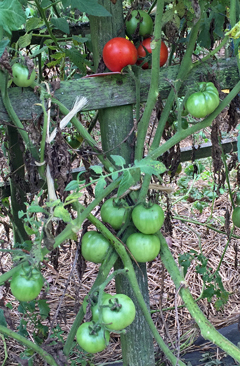 I have heard that other people are having similar issues with their tomatoes; slow growth and the production of very few tomatoes that are all small in size. 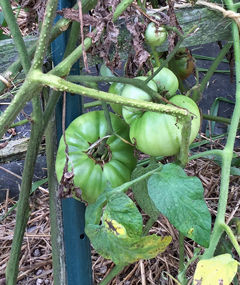 It may just be a bad year for growing tomatoes! Unfortunately, it doesn’t look like we will be harvesting very many tomatoes this year. We should have enough to enjoy fresh but I’m pretty sure we won’t get enough to can. The pole beans are doing very well! 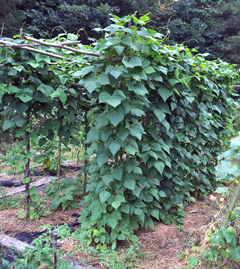 On the bright side, the pole beans are doing very well except for 2 or 3 poles where some critter has nipped off the lower leaves. The vines are still strong and producing lots of beans at the top. We planted Rattlesnake beans, a purple pole bean, and a new one for us – Lazy Housewife Pole Beans. Yum! The cucumbers have also produced well this year. So far I’ve made 23 pints of my famous bread and butter pickles and still have plenty to slice up for my lunches and I’ve even given a bunch away! I’ll be making more pickles this weekend and freezing beans, too! Here’s hoping your tomatoes are doing better than mine! Is that pollen on your nose? Take time to stop and smell the flowers! Have you ever noticed small children in a flower garden? 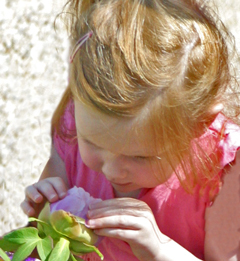 They tend to immediately bury their little noses into the flowers and smell them. We adults need to take the time to do the same – and many of us do! Especially when the daylilies are blooming at the nursery, I see so many people, adults and children alike, walking around with the telltale sign of flower sniffing – orange pollen on their nose! 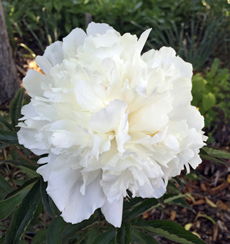 The peonies and iris are blooming in the gardens now and many of these have a wonderful sweet fragrance. When planning a garden, it is important to not only consider form, structure, texture, and color in the flower bed, but also fragrance. Your sense of smell can often bring back pleasant memories of places and times in your past. 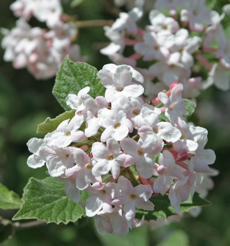 Whenever I walk past a blooming Viburnum carlesii, I am transported back to my childhood home where a magnificent specimen of these intensely fragrant shrubs grew at the corner of our patio. Be sure to incorporate some of those plants into your gardens! You should plant pockets of fragrant flowers where you will enjoy them the most – near the porch, deck, patio, or poolside. Another good place for a touch of fragrance is along a favorite garden path or beside your sidewalk or driveway. If you place plants with fragrant foliage at the edge of your garden path, the fragrance will be released when you brush against it as you pass by. An interesting idea to keep in mind! The fragrance of certain flowers is more obvious during various periods of time – when the weather is warm and the air moist, or when the sun goes down and the night bloomers emit their sweetness into the air. 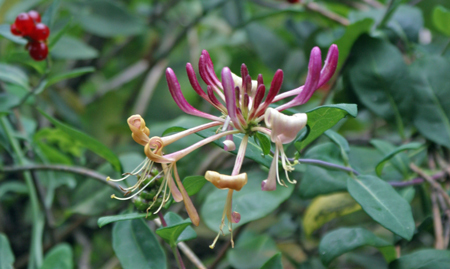 I love driving by a patch of wild honeysuckle in the early evening with the windows down – their sweet perfume just wafts into the open windows. 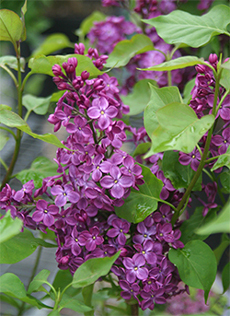 Fragrance can be added to the landscape and garden through the use of trees, vines, shrubs, annuals, bulbs, and perennials. There are many fragrant choices in each of these categories. There are many plants that produce fragrant foliage rather than fragrant flowers but the fragrance is none-the-less intoxicating. 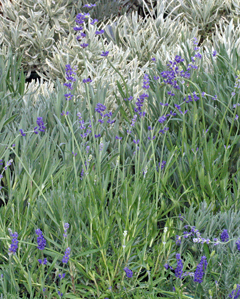 Try the many varieties of thyme, lavender, rosemary, basil, the mints, and a host of other herbs. Artemisia, hay-scented fern, sweet woodruff, lemon grass, lemon verbena, heliotrope, and scented geraniums are a few others that will add a pleasant scent to the garden or containers. And, of course, everyone loves the many fragrant boughs of evergreens that are used at Christmas time to bring a spicy, nostalgic aroma indoors. Until next time – Don’t forget to stop and smell the flowers! Fill your House with Plants that Clean the Air! Andre talks about it all the time! Plants are a wonderful “bio-air filter”. With the increase in energy-efficiency in new homes, indoor air pollution is on the rise. Buildings are being sealed tighter to restrict outside air exchange in order to lower heating and cooling costs. While this does reduce energy consumption, the recirculated air can accumulate a host of pollutants which come from everyday products and activities. These pollutants can build up and cause upper respiratory problems and allergic reactions. They’ve even given this a name: “Sick Building Syndrome”. But don’t worry – green plants can come to your rescue! There is a lot of scientific evidence showing that plants can actually help improve air quality both indoors and outside. Research conducted by NASA has demonstrated that many plants have rather impressive air-cleaning abilities. In general, NASA found that plants that grow under low light conditions and have large leaves are the most effective at removing indoor pollutants. Spider plants, Peperomia, Schefflera, pothos, Dracaena, and Aloe are some of the best “air purifiers”. So keep a few houseplants around the house. They not only provide beauty to your indoor landscape but they will act as a great natural air filter as well! Maintaining healthy houseplants will help them perform this important “air-cleaning” task most effectively. The easiest way to ensure that your houseplants remain healthy is to understand their preferred growing conditions. There are many different types of indoor plants and each has its own optimal light conditions, water requirements, and temperature and humidity levels. If you provide them with the right conditions, they will reward you with their beauty and some clean, pure air. Click for specific growing conditions for some common houseplants. The following are some general tips to promote the health of your houseplants. will brighten up your home. More houseplants are probably killed due to improper watering than anything else! The rate of water loss and thus the need to water your houseplants depends upon temperature, humidity, and light levels as well as the type of plants you have. Thus, it is hard to set a strict watering schedule. Know the requirements of your plants and use the “touch method” to evaluate soil moisture and the need (or not) to water. Press the tip of your finger down about 1/4” into the soil. A dry feeling indicates that you should water. If you have a lot of house plants, you might want to consider getting a watering wand you can use indoors! Plants bring a bit of nature indoors. Fresh potting soil contains a reservoir of nutrients but as your plants grow, they absorb this “food” and the nutrients eventually need to be replenished with fertilizers. Fertilizer for houseplants comes in many different forms. Dissolving powders are one of the most economical ways to fertilize your houseplants. Fertilizer spikes and slow release fertilizers are even more convenient and easy to use for your potted plants. Bayer Advanced makes plant spikes for indoor and outdoor potted plants that control certain insect pests and also contain a slow-release fertilizer. Liquid fertilizers are also popular and easy to use. Dust and dirt on leaves block light and reduce photosynthetic activity. This causes decreased vigor and gradual decline in the plants. There are many ways to clean your houseplants. Larger plants can be put directly in the sink or shower and sprayed with water. Smaller and more delicate plants can be turned upside down (use your hands to hold back the soil) and dunked and swirled around in a sink or bucket of water. Always let the leaves dry completely before exposing them to direct sunlight. For more information on the air filtering qualities of plants, check out Andre’s favorite book on the subject: How to Grow Fresh Air: 50 House Plants that Purify Your Home or Office by Dr. B.C. Wolverton. Until next time – have a Happy Thanksgiving!